What can be a better way to be introduced to a chef than by a taste of his skill? As The Taj Mahal Hotel, New Delhi welcomes their new Executive Chef, Arun Sundararaj, we are treated to a beautiful evening that pleases all the senses. 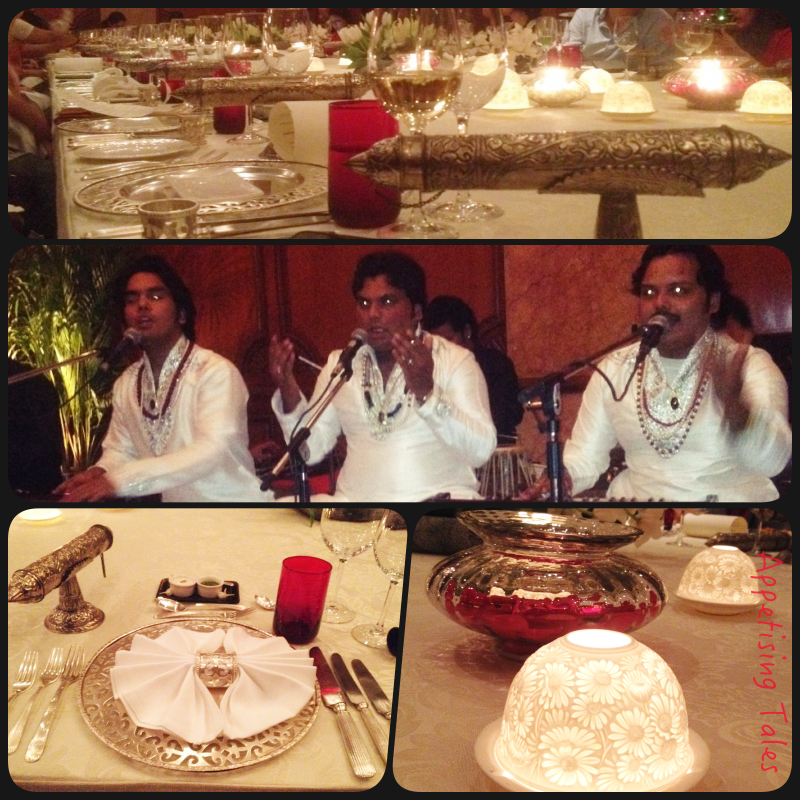 The beautiful setting and silver service for our Hyderabadi meal; the Nizami Brothers. 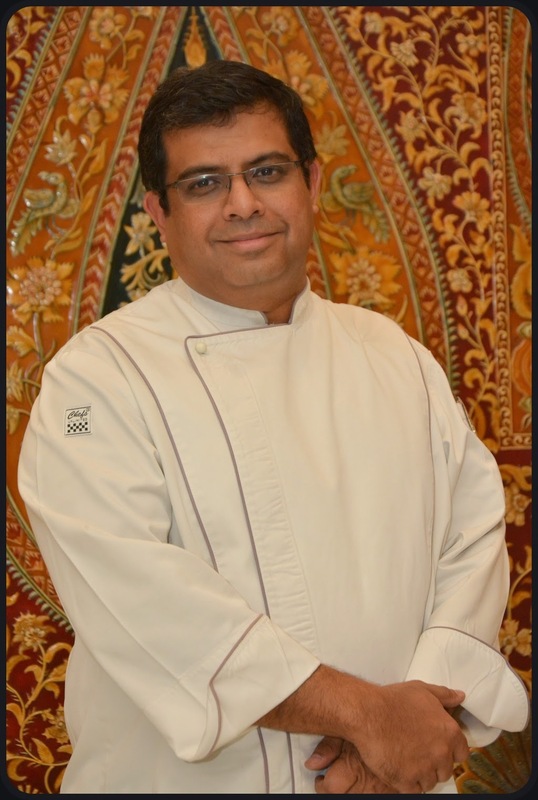 In his 23 years with the Taj Group of Hotels, Chef Arun has been known to serve art on a plate at hotels including the Taj Mahal Palace in Mumbai, and the Taj Exotica, Goa. Since his last assignment was as the executive chef at Taj Falaknuma Palace, Hyderabad, Chef chooses to serve us a meal fit for the nizams. The sit down dinner is set in the Aftab Mahtab fragrant with fresh flowers, dimmed to an ambient lighting, enhanced by beautiful votives and energised with Sufi Qawwali by the Nizami Brothers from Darya Ganj. Bottom: Luscious haleem and the dessert platter. I love the menu that includes not only the famed delicacies of Hyderabadi cuisine, but also depicts the Hyderabadi tehzeeb. The Agaz or the beginning is made with Dahi Ke Kebab. Made with hung yoghurt, cardamom and green chillies, they are packed with flavour and a nutty centre. Then comes the Mezban, "a tasting plate of closely guarded secrets of nizam's culinary repertoire". This includes Zimmikand Shikampuri Kebab and Bharwan Paneer Tikka, but since I opt for the non-vegetarian selection, I am served Pathar Ke Gosht and Shikampuri Kebab. I usually don't use such language on my site, but Oh My God! I wouldn't be lying if I tell you that these are the best kebabs I have ever had. I love the smokiness in the pathar ke gosht that have been cooked over a hot granite stone after being marinaded for over 48 hours. And the shikampuri kebab literally melt in my mouth; the goodness of ground lamb with a mild yoghurt filling leaving a lingering taste on my palate. I know there are better things coming, else I would request for a second helping! Ithmenan Se showcases slow cooking at its best. Haleem, a traditional Ramazan favourite is succulent mutton and wheat cooked for a long period of time until the mutton loses its texture entirely and becomes a hearty stew. Now, I have had haleem on different occasions at various places and despite its popularity I have never enjoyed it. Its viscosity and oiliness often made it unpalatable for me. But not tonight. Chef Arun's haleem is simply fantastic. It is rich, but I can't feel the grease on my tongue; and the flavour is just beautiful. Mashgool Dastarkhwan is a selection of royal Hyderabadi delicacies like Dum Ka Nalli Gosht, Pista Murg ka Salan, Nizami Handi, Khatti Dal and Dakhni Saag. While I would have preferred the chicken in the murg ka salan to be more tender (only because I have been spoilt by the preceding dishes) everything tastes great. But the Hyderabadi Kachhe Gosht ki Biryani is something else. The meat is again meltingly good, the rice is fragrant and delicious and I don't need any of the accompaniments, whether fancy or the simple dahi; I can just keep having this biryani. The grand finale to this evening, along with a wonderful rendition of my request - Damadam Mast Qalander, is Zauq E Shahi, or the chef's tasting platter of Hyderabadi desserts. This comes with an aromatic and lightly sweet Gil E Firdaus or lauki ki kheer, Double Ka Meetha that is an Indianised bread pudding and Khubani Ka Meetha. This last being a wonderful version of the apricot. Apparently it is very famous in Hyderabad but this is the first time I've had it, and it is yum! And just in case you're envying me for indulging in this fab meal, fret not 'cause you can have it too. 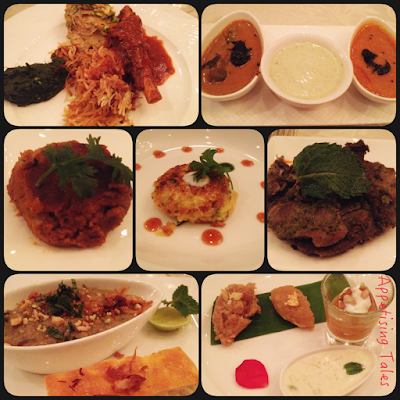 Chef Arun's creations will be featured in a special Saturday Brunch at the Machan all through the month of June. 1, Mansingh Road, New Delhi-1100011. Price: Rs 2,500 per person for the Saturday Brunch.